Christmas always seems to come quickly. A time of joy, it is also a time of sorrow, a time of remembrance and a time of peace. All of these qualities reinforce that the meanings of Christmas are complex, but that complexity accounts, in part, for its beauty. I would like to take this opportunity to wish all of those who read this blog a Merry Christmas and a Happy New Year. I greatly appreciate your support of this blog and I hope that you will continue to read future posts. Above: The most well-known portrait of Anne (left). 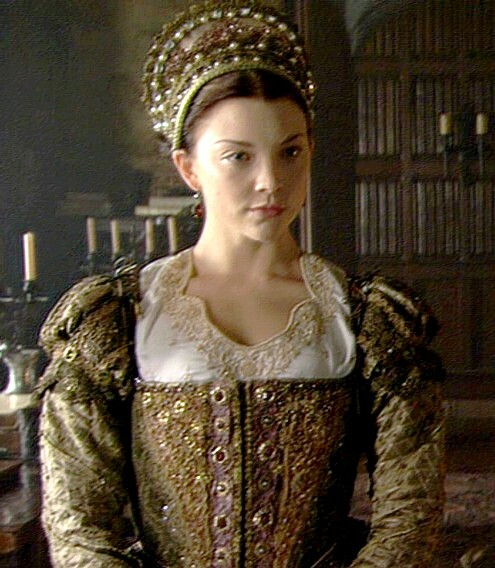 Natalie Dormer played an especially fashionable Anne in television series The Tudors (right). Anne Boleyn is, and was, regarded as an elegant woman who deeply loved fashion. It is telling that the virulent propagandist Nicholas Sander, who claimed in his account that Anne was monstrously deformed, felt compelled to describe Anne's love of dress thus: 'She was unrivalled in the gracefulness of her attire, and the fertility of her invention in devising new patterns, which were imitated by all the court belles, by whom she was regarded as the glass of fashion'. If we were not aware of Sander's background and his fierce opposition to Henry VIII's second marriage, we might think that he was an admirer of Anne. Whether, in describing her love of dress, he was merely relating a fact about the queen, or whether he was using it to portray Anne as frivolous, is uncertain. While there has as yet been no individual study of Anne Boleyn's clothing, in most biographies of her there is some exploration of her love of dress. Sander later explained: 'She was the model and the mirror of those who were at court, for she was always well-dressed, and every day made some change in the fashion of her garments'. Sander was probably drawing on contemporary evidence dating from Anne's own lifetime. Lancelot de Carles, a French scholar, poet and diplomat who was at court at the time of Anne's fall, described her as 'beautiful and with an elegant figure'. George Wyatt, who wrote a sympathetic account of Anne, described her as well-dressed. Contemporary observers, then, tended to agree that Henry's second wife was elegant and well-dressed. However, none of them referred to Anne's supposed favourite garment - the French hood. Modern history writers have tended to assert ad verbatim that Anne either introduced the French hood to England or popularised its use following her return to England in 1522. There is surprisingly little evidence for the first assertion. This blog post seeks to examine the evidence for the headdresses that Anne favoured and seeks to ask the question of whether Anne introduced, or popularised, the French hood in England. Above: The most well-known portraits of Anne present her wearing a French hood (left). 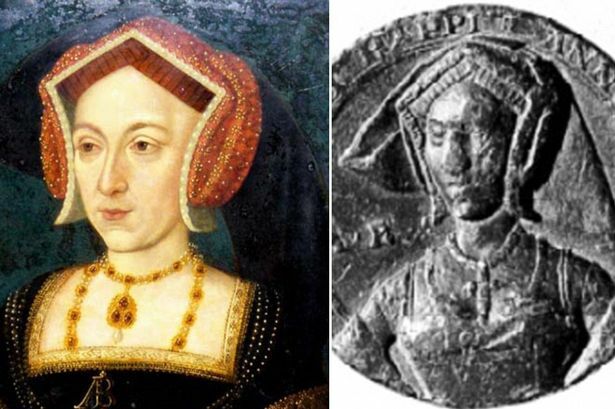 Anne has become so associated with the French hood that it almost always appears in popular representations of her, as in the film The Other Boleyn Girl (right). As we have seen, contemporary writers stressed Anne's love of fashion and her ability to dress well, whether they were her admirers or her enemies. They did not, however, describe her as wearing the French hood, which is perhaps surprising given that it was a garment viewed as elegant and chic. We have some surviving accounts of Anne's personal spending on clothes. Shortly before her arrest, we know that she bought gowns in tawny velvet with black lambs' fur; in velvet without fur; in damask; in satin, furred with miniver; a russet gown in heavy silk; two in black velvet and one in black damask; one in white satin; one with crimson sleeves; a purple cloth of gold gown lined with silver; eight nightgowns; three cloaks; and thirteen kirtles. Anne's gowns were often embroidered with jewels; in early 1532, for example, she was provided with a gown with nineteen diamonds set in trueloves of gold, along with twenty-one rubies and twenty-one diamonds set in gold roses and hearts. At every occasion, Anne's costume was detailed - at court entertainments, at her coronation, and most spectacularly, on the scaffold. We know that she seemed to favour the colour black. We also learn from her accounts that she was greatly occupied with her daughter Elizabeth's attire. In a period of three months, the queen bought her daughter a gown of orange velvet, kirtles of russet velvet, of yellow satin, white damask and green satin, embroidered purple satin sleeves, a black muffler, white ribbon, Venice ribbon, a russet damask bedspread and a taffeta cap covered with a caul of gold. Anne's lavish spending on dress should not be misidentified as evidence of vanity or frivolousness. At this time, a monarch was expected to be immaculately dressed and be spectacular in appearance, in order both to impress and reassure one's subjects, and to project a confident aura to neighbouring kingdoms. In dressing outstandingly, Anne was seeking to glorify her husband's lineage and strengthen her claim to be England's true queen. There is some evidence that Anne wore the French hood. In the same accounts that detail Anne's expenditure on gowns, it is related that she spent up to £9 on the French hood, a costly sum in the sixteenth-century. In surviving paintings of the queen, she is usually portrayed wearing the French hood, as can be seen in the most famous portrait of her housed at the National Portrait Gallery (see the top of the page). However, it is worthwhile asking whether she really did introduce the French hood to England. The short answer to this is no. Above: Anne of Brittany wearing the French hood, c. 1500-1510. The French hood was characterised by its rounded shape, and was worn over a coif that was tied under the chin or secured to the hair. It had a black veil attached to the back, which covered the back hair completely and hung in a straight fashion. The billaments were usually costly, these forming the decorative border along the upper edge of the hood and the front edge of the coif. As the name indicates, this style of headdress was especially popular in France and probably originated in Brittany. Early admirers of the hood included the consort Anne of Brittany, who is shown wearing it in numerous depictions of her. Claude of France, wife of Francois I, also favoured the French hood, as can be seen in surviving portraits of the queen. Above: Claude of France favoured the French hood, as can be seen in this portrait of her. The French hood was similar to the round hood, which was worn by women living in the Imperial territories. Queen Juana of Castile, for example, favoured the round hood. By the time that Anne Boleyn arrived in England, the French hood was a popular and fashionable item of headwear worn across Europe, especially in its native land. Its use was not yet, however, widespread in England. Interestingly, the first English woman portrayed wearing the French hood was not Anne, but Henry VIII's younger sister Mary, duchess of Suffolk. In 1515, Mary married Charles, duke of Brandon, and the couple were painted the following year. It is not surprising that Mary favoured the French hood. At the age of eighteen, she had married Louis XII of France, thus becoming the French queen in the process. Presumably, she chose to wear the French hood as queen in order to appear fashionable: as we have seen, contemporary monarchs were expected to appear dressed in lavish costume in order to glorify the monarchy. 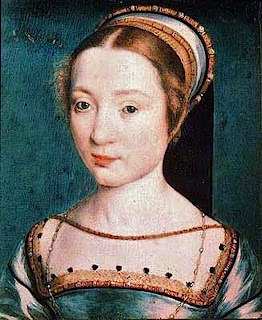 Following the death of Louis and her remarriage, Mary chose to continue wearing the French hood in order to appear fashionable and to emphasise her rank: she was one of the highest-ranking women in the kingdom because of both her Tudor blood and her marriage to a duke, one of only two in England. For Mary, the French hood was associated with lineage, with power, and with splendour. Above: Mary Tudor and her second husband, Charles Brandon, duke of Suffolk. In the portrait, Mary is wearing a French hood. By the time that Anne Boleyn returned to England in the mid-1520s, the French hood was not yet a garment that was worn by many women at court. While Mary Brandon favoured it, the majority of English noblewomen and gentlewomen continued to wear the gable hood, which was also worn by Katherine of Aragon. Given the popularity of the French hood in continental Europe and its early usage in England, it cannot truly be claimed that Anne Boleyn 'introduced' the garment to England, because it was already known there. It is possible, however, that she popularised its usage. As we have seen, few female courtiers wore the French hood in the mid-1520s. Anne Boleyn spent great sums on the garment and, presumably, wore it on a regular basis, although it cannot be known for certainty. 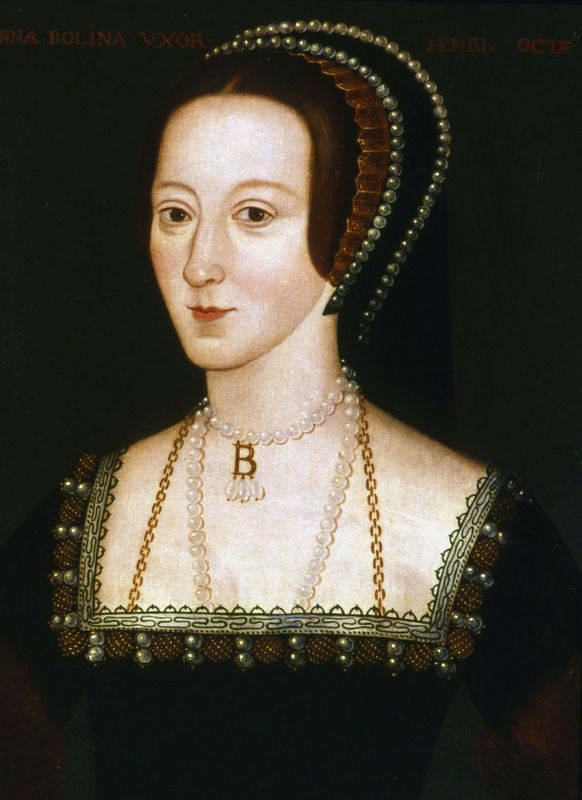 There are numerous difficulties in using Anne Boleyn's reputed portraiture to assert that she favoured the French hood. A recent trend, first advocated by Susan E. James and later mentioned by G.W. Bernard in his recent biography of Anne, asserts that the standard portraits of Anne are not of her at all, but are probably based on paintings of Henry's sister Mary. Certainly, there are facial and physical similarities, and James claims that the 'B' choker worn by the sitter actually refers to the surname Brandon, rather than Boleyn. While James' claim has been refuted, her argument does warn of the dangers in viewing alleged portraiture of Anne as true depictions of the real woman. The distinguished historian Lacey Baldwin Smith famously referred to Tudor portraits bearing as much resemblance to their sitters as elephants to prunes. This is nowhere more true than in the case of Anne Boleyn. Recent research has questioned whether the NPG portrait of Anne is a portrait of the queen at all. Following her downfall, the majority of paintings of Anne were destroyed or hidden away, and only after her daughter Elizabeth's accession to the throne was it deemed acceptable to paint her again. Thus, the majority of portraits of Anne are later copies, dating at least forty or fifty years, if not more, after her death. The NPG portrait, and the Hever Castle version in which Anne is shown holding a red rose, were painted late in the sixteenth-century or early in the following century. As Brett Dolman has written: 'All of these paintings... give the impression of mechanistically copied and simplified 'head and shoulders' portraits'. It is possible, as has been suggested, that by the time of Elizabeth's triumph 'a pool of portraits of unidentified women dating from the reign of Henry VIII still existed. As was common, these original paintings were not labelled and... the identities of the sitters were generally problematic. Yet for copyists in need of an image, clues within and without seem to have encouraged them to arrive at speculative identifications. 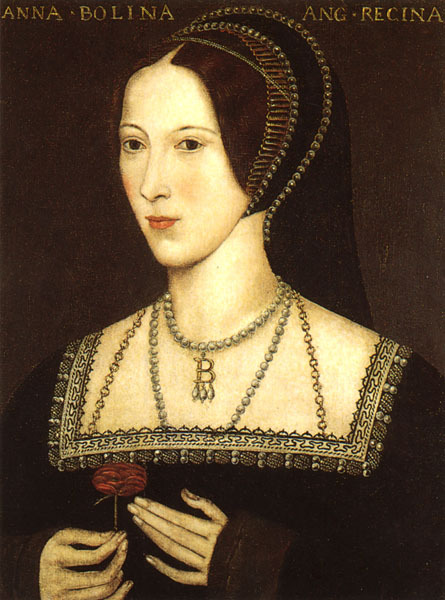 The face pattern for Jane Grey was Kateryn Parr and the face pattern chosen for Anne Boleyn was Mary Rose Tudor' (Susan E. James). While controversial, James' argument does have some merit: it is extremely difficult to arrive at firm identifications of sitters in Tudor portraiture, as continuing controversy over the portraiture of Katherine Howard and Lady Jane Grey, for example, demonstrates. Whether or not James' claim can be agreed with, it is important to be cautious in analysing Tudor portraiture and searching it for clues as to a sitter's 'true' appearance or identity. The most famous portraits of Anne Boleyn were produced only fifty years, or more, after her death, and the facial features were probably based on those of another woman, perhaps even those of Elizabeth herself. It is impossible to view the NPG portrait, for example, as evidence for what Anne really looked like. In relation to this article, although Anne is identified as wearing the French hood in most of these portraits, this does not necessarily mean that she favoured the garment over its English gable counterpart: rather, it reflects the artist's understanding of fashionable dress at Henry VIII's court and what he (or she) might have expected Anne, as a queen during the 1530s, to have worn. Above: The Nidd Hall portrait of Anne (left). The only undisputed surviving representation of Anne from her own lifetime, the 1534 medal (right). Other visual representations of Anne depict her wearing the gable hood, which was the preferred item of headwear for the majority of women at the English court during her life. The only undisputed contemporary portrait of Anne is a lead prototype medal now housed in the British Museum. It dates from c.1534, the year in which Anne was thought to be pregnant with her second child. In it, the queen is clearly shown wearing a gable hood. Other later portraits followed the 1534 style and portrayed Anne wearing a gable hood, as shown in the Nidd Hall portrait, in which the queen wears a gable hood and brooch in the form of a single drop pearl hanging from the monogram 'AB'. Recent research from earlier this year has indicated that the Nidd Hall portrait matches the 1534 medal. Certainly, the queen was described as wearing a gable hood during her own lifetime; it was the headdress she chose to wear on the scaffold on 19 May 1536. Historians have suggested that she elected to wear the gable hood that day in order to proclaim her English background, or to assert her place as a queen of England. More possibly, but less commonly argued, it was simply because the gable hood, rather than the French hood, was Anne's preferred choice of headdress. We cannot known for certainty. This article has demonstrated that Anne certainly wore the French hood and spent a good deal of money on the item, but it has also indicated that she was known to wear the gable hood and possibly favoured it, as seen in her decision to wear it on the last day of her life. This article has also sought to inject a note of caution in examining Anne's reputed portraiture for evidence of her fashion interests. It is apparent that the French hood was not introduced to England by Anne Boleyn, but it is possible that she popularised it. By the 1540s, it was a highly fashionable garment and was worn as a marker of high status. Henry VIII's last two wives, Katherine Howard and Katherine Parr, both favoured the French hood, and it was worn by the young Elizabeth and by her older sister Mary, later Mary I.